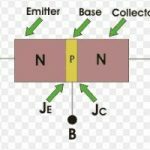 When we connect a battery across a P type semiconductor let us see that what happens. The free electrons and holes experience the force towards the battery terminals. The free electrons will tend to move towards the positive terminal and jump into the available holes of boron atoms. 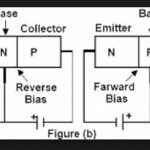 Since the free electrons are not available in P type semiconductor, therefore, electrons that are moving towars the positive terminal come from covalent bonds. This tendency of the electrons to leave the covalent bonds is due to the fact that holes are available in front of them. An electron from one covalent bond jumps into the hole in front of it, thus leaving a hole in the covalent bond it has left. This electron now jumps into the next available hole and so on. As this process continues, it it apparent that holes are shifted towards the negative terminal of the battery. It should be noted that in P type semiconductor, free electrons are simply transfered from covalent bond of one atom to a neighbouring atom. Thus, movement of positive charges takes place in a direction opposite to that of free electron movement. 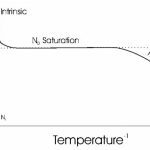 In a P type semiconductor, the current flows due to the movement of holes and free electrons. Since hole being the majority carriers and free elctrons beimg the minority carriers, the net current will be due to the majority carriers i.e. the holes. Thus, in a P type semiconductor, a major part of electric current flows due to the movement of holes. 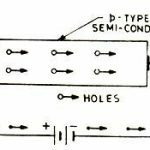 This current is called hole current i.e. drift current. The direction of conventional current will be the direction of movement of holes.